For the last two years, the students at Brinson Memorial Elementary have learned about the impact of dirty water on the people in third world countries. As a school, we decided we wanted to make a difference in the world. We realized that one person can make a difference, but if we all work together we can change the world. One way we could do this was to earn money to build a well so these people could have clean water and we could change their world. 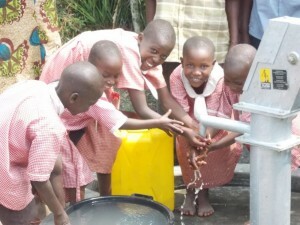 Last year we were able to build a well at the Bunonko Primary School in Uganda. What a blessing for the children and the community to have clean water! This year we set our goal at $7000. Please help us reach our goal so we can bring clean water to another group of people. 03/24/14 Linda Elsass $230.00 A great project for the students! 03/23/14 Susan Mabie $46.00 Thanks for the great work you do with our kids, Jan. We have followed your good work for a number of years and are very proud of your commitment, energy and determination.